The UT Digital Hybrid Wireless™ is a state-of-the-art, 100mW handheld transmitter incorporating many advanced features in order to give the user a wide range of possibilities for high-quality speech and vocal performance. 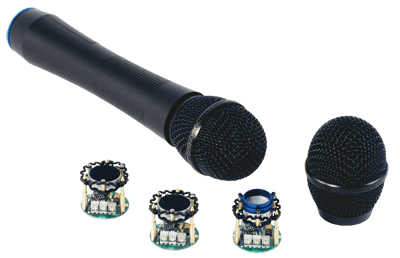 The proprietary VariMic™ element allows custom tailoring of the microphone’s frequency response, while a digitally-controlled input limiter ensures distortion-free audio over a very wide dynamic range. At the heart of the UT is the VariMic™ preamp, included with each of the three different electret condenser capsules. The elements are mounted on a tuned suspension to reject handling noise, while a generously sized windscreen prevents popping and breath noise. The preamp board also includes three tone controls and one variable attenuator, allowing the user to tailor the microphone’s audio without changing the capsule.